As you already know, we are in Southern California this weekend to follow around the USC Trojan Marching Band. This trip also has a special surprise that we are ready to announce. 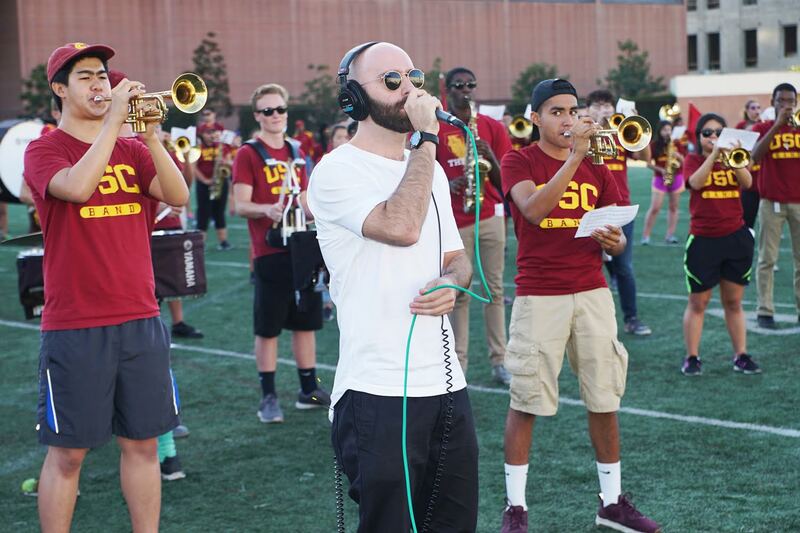 The X Ambassadors will be on the field at halftime performing "Renegades" and "Colliders" with the band! We will be covering the bands every move today, so make sure you follow along on facebook and come back after the game to watch the performance. Below is the press release from the band. Nov. 4, 2016 – As is tradition, the Trojan Marching Band (TMB) will invite guest performers to the Los Angeles Memorial Coliseum for its annual Homecoming halftime show this Saturday. Alumni bandsmen and women will perform, of course, but The Spirit of Troy will also welcome special guest artists from the rock group X Ambassadors. Lead singer Sam Harris and drummer Adam Levin from X Ambassadors — best-known for their platinum single “Unsteady” — will join the TMB on the field for the show’s finale. The marching band will provide backup to Harris’ vocals on “Renegades” and “Collider”, the theme song for this year’s coverage of college football on ESPN. This latest collaboration will be the fitting coda to a halftime show celebrating The Spirit of Troy’s well-earned status as the “rock star” of marching bands. The TMB will open the show with songs by artists they’ve collaborated with this year: “Hand Clap” by Fitz and the Tantrums and “Light It Up” by Major Lazer. The band joined Fitz and the Tantrums for the encore of their show at LA’s Greek Theatre last month and performed with Major Lazer at the Coachella music festival in April. Alumni band members will also be featured. Over 80 trumpet players from years past will play their signature song “Heartbreaker” with the current TMB.